German Shepherds are bold, eager, alert and cheerful. They are known for their courage and loyalty. They are serious and almost human like with their intelligence. They love people and should not be isolated for long periods of time. With their roots in guarding German Shepherds have a strong protective instinct and are naturally territorial. 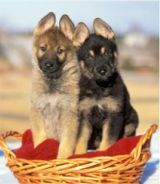 German Shepherd puppies need to be trained and controlled firmly and consistently. 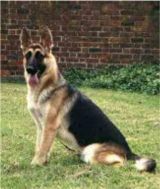 German Shepherds keenness to learn and intelligence, makes them ideal as working dogs and they are regularly seen in the military and as guide dogs for the blind, hearing dogs for the deaf and helping dogs for the disabled.